The menu reflects a sort of fetishized vision of health. As with most health-food restaurants, you get the sense that Wholism has more on its mind than just food. 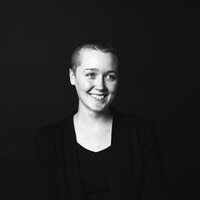 Maybe it's because of the section on the menu dedicated to "superfood lattes" or the jungle of plants that hangs along the white walls of the window-lined cafe. Or maybe it's the motto, emblazoned on the bottom of each menu: "Let's change the way we eat, live and treat each other." In physical terms, that philosophy translates to a counter-service Hawthorne Boulevard restaurant with a pristine, minimalist aesthetic and a menu that reflects a sort of fetishized vision of health. 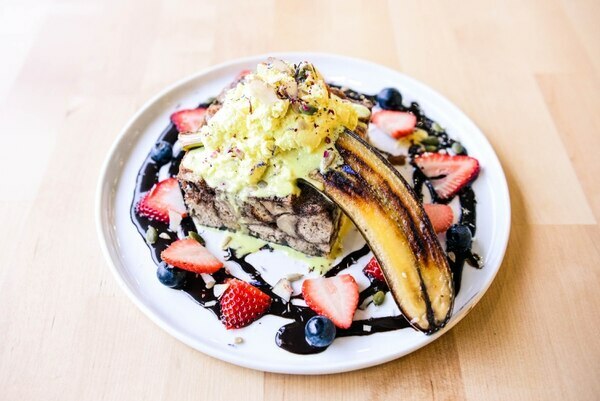 The kitchen is gluten-free and "plant-based"—which, according to the restaurant's blog, is basically veganism driven by health instead of ethics. The housemade coconut yogurt is slow-cultured, the savory cream sauce contains raw and sprouted cashews, and the pad thai is made with raw vegetables. About a third of the menu contains turmeric in some form. Some of the more obscure ingredients in the three superfood lattes are marked with an asterisk that leads you to a list of their phytonutrients. Nothing at Wholism is straightforward—even if you're the kind of person who thinks of raw pad thai ($13) as commonplace, you've probably never had it served with sauerkraut. But for better or for worse, the flavors are far less esoteric than the ingredients. The lentil and kale curry ($13) is underwhelmingly aromatic for curry, but as a sort of creamy lentil soup, it's placid and comforting. The coconut milk broth is a bit of a wallflower, but the serving of meaty lentils is hearty and dotted with chunks of bright-orange sweet potato. Even though Wholism's version doesn't have the dank flavor you'd expect from curry, it's one of the most satisfying manifestations of the restaurant's aesthetic minimalism. 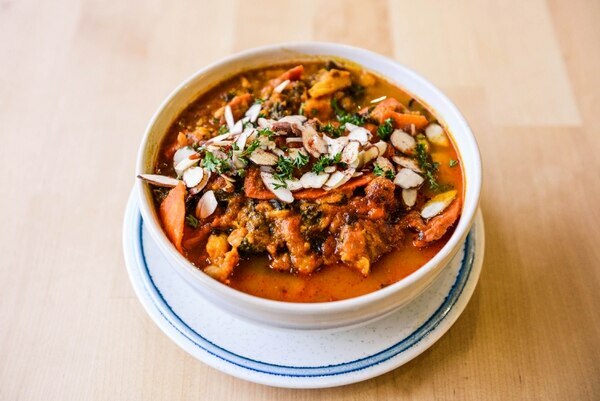 The best part of the curry is the kale, which is stewed to the perfect texture between chewy and melt-in-your-mouth. 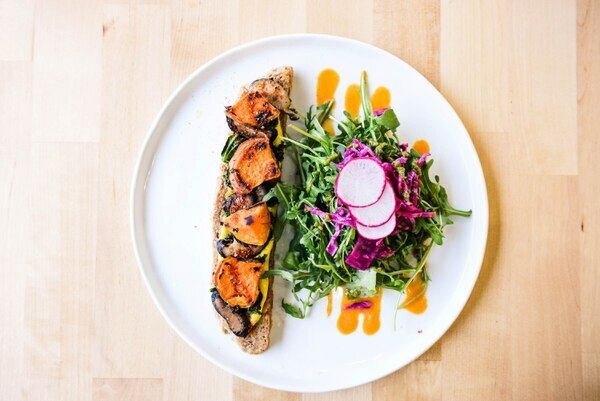 The toppings on the mushroom and kale toast ($9) look as if they were individually placed—three chunks of sweet potato evenly spaced between shiitake mushrooms and bits of roasted kale on a pale chunk of bread. There's a lot that can go wrong with gluten-free bread: Wholism's "focaccia" is definitely not focaccia, although it is a hearty, soft and chewy loaf that's dense but velvety. Strangely, the only part of the dish that went wrong on our visit was the one that seemed foolproof—the shiitake mushrooms, which were dry and rubbery. The toast comes lathered with turmeric vegan butter, which helped add a little flavor and moisture to the mushrooms but had an alien, goopy texture. There's an odd disconnect between Wholism's avowed simplicity and its use of pricey ingredients with intangible wellness benefits that don't really seem to do much for flavor. 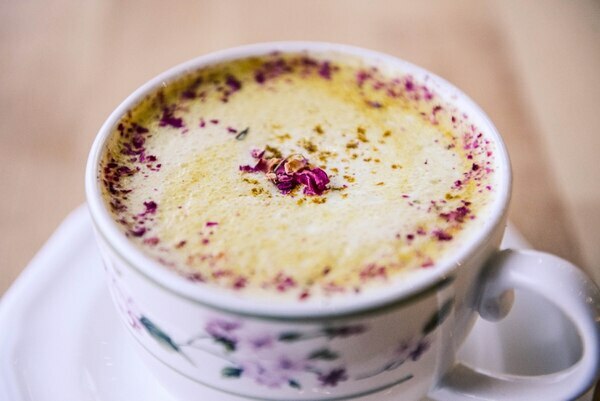 The turmeric and saffron superfood latte ($5) contains not only an expected mix of spices like ginger and cinnamon but also ginkgo, ginseng and cordyceps, a type of fungi claimed to cure everything from cancer to impotence. The result is, well, a fairly standard turmeric latte. The blend of spices provides a soothing warmth, and the foamed coconut milk buoys the flavors instead of just acting as a substitute. The banana bread pudding ($14) is the most innovative adaptation on the menu. Instead of inundating its chewy, gluten-free bread with cream and sugar, Wholism's version gets most of its sweetness and gooey texture from chunks of baked banana. It gets even more moisture from a massive tower of coconut whipped cream, tinted pale orange from a hint of turmeric, that basically doubles the size of the dish. It may not be nearly as gooey or as sweet as the real deal, but the reined-in decadance is clearly intentional. The fact that Wholism has managed to make a low-sugar, gluten-free bread pudding that doesn't taste like a brick of cardboard is a minor miracle. Clearly, Wholism isn't totally lacking in substance. But health doesn't look or taste like just one thing, and it's a little bothersome that such a niche idea of what "eating healthy" looks like—one that isn't exactly cheap—has become so omnipresent. 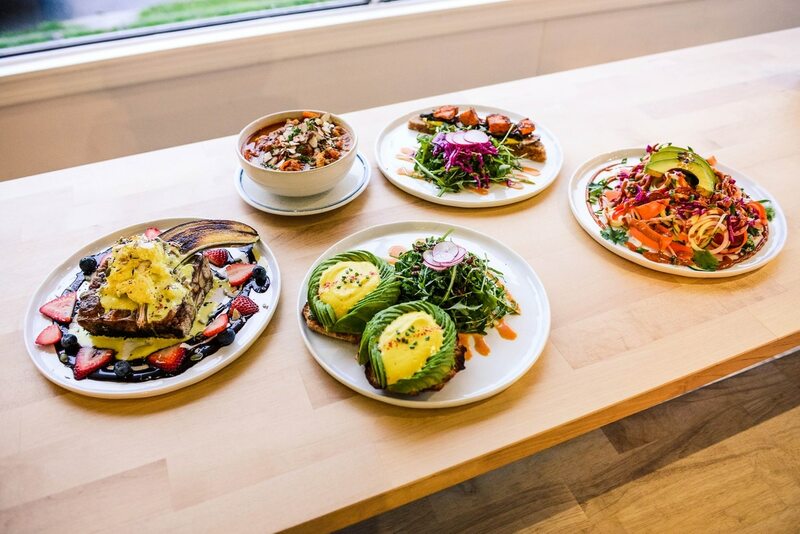 Wholism's menu is built on one narrow definition of nebulous wellness, and in Portland's competitive midlevel dining market, where there's a growing number of vegan and gluten-free options, that definition is mainly what Wholism is selling. If $13 salads and cordyceps-spiked lattes are what make you feel good, that's great. But putting turmeric in whipped cream isn't actually going to affect how we treat each other. EAT: Wholism, 4604 SE Hawthorne Blvd., 503-236-1466, wholismpdx.com. 9 am-5 pm daily.